The latest NZ Property Report from Realestate.co.nz was published at the end of last week. Its value lies in the key market indicators of inventory and listing numbers, providing a guide to the state of the property market and the trends we are likely to see in the coming months. It can be judged to be a forward-looking report as compared to historical sales data from REINZ. As an industry-owned site, Realestate.co.nz is without doubt the most comprehensive window onto the market with pretty much universal support from all agencies. I might argue, that far from being a surprising headline, the notion of new listings being at “all-time low” is something that has perplexed the market for the greater part of the past 9 years since the GFC. 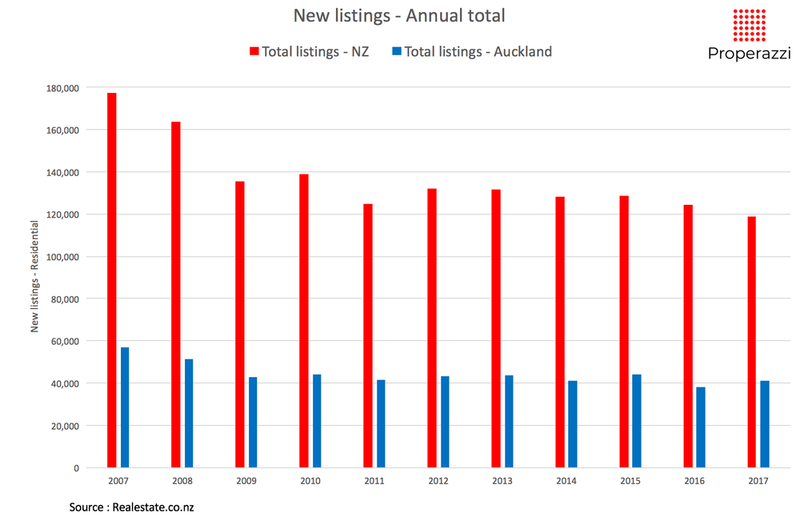 The chart below shows the annual total of new listings for the past 11 years. The most recent 12 months has seen a total of 118,647 new listings hit the market. The lowest annual total since data was first collected in 2007. Compared to a year ago, new listings are down 4.5%, with 5,500 less properties for buyers to choose from. For Auckland though, the most recent 12 months has been a slightly bit brighter. A total of 40,870 new property listings have hit the market, up 8% as compared to last year, however nothing like the c. 60,000 new listings per year seen a decade ago. Auckland may well be finding a new balance between a buyers’ market and a sellers’ market as the NZ Property Report stated and the media promoted, but the City of Sails is far from awash with an abundance of listings. There are currently at this time just under 9,000 residential properties of all types for sale across Auckland – this for a city of 1.377 million people. Pre-2008 GFC there were around 11,000 properties for sale, at the time, judged a fairly balanced market. Whilst defining the state of the property market by the measures of inventory and new listings and comparing them to long term averages as Realestate.co.nz does is a fair method. I have though long been pondered how best to measure the state of the property market as a valuable guide to future trends. There is certainly no shortage of stats on the market – sales volumes, new listings, days on the market and inventory. Looking afresh over the past few weeks I have been pondering the notion of clearance rate as an indicator. The idea being that the state of the market can be reflected in the proportion of new listings that actually sell. Simply put, what percentage of properties that are listed are sold in a given time period? This is difficult to do in respect of specific properties, but in aggregate, for a specific time period we can look at the number of sales as a percentage of the number of listings; mashing together the REINZ sales data with the Realestate.co.nz listings data. These two data sets pretty much match apples-with-apples as they represent 100% of all licensed agent listings. The chart below shows the clearance rate for total NZ residential listings from 2008 to date using a 12 month moving total comparison. To my way of looking at it, a fair representation of the activity in the property market over that period. Peaking at 74% in the middle of 2016 before slipping back to 62% currently. At its worst, at the start of 2009 in the depth of the GFC just 34% of listings were selling. 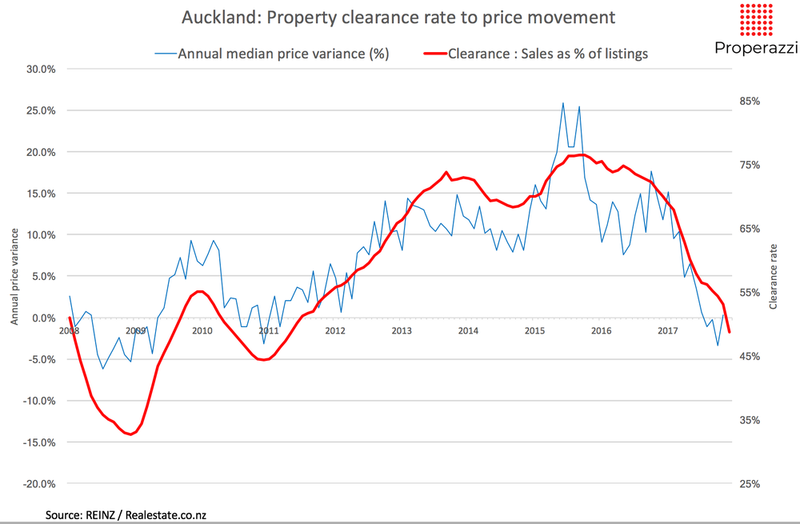 For Auckland the picture is somewhat similar, although the most recent 2 years has seen a more significant decline; peaking at 76% at the end of 2015 and slumping to below 50% today – so effectively in Auckland today only half of all new listings are selling, a situation not seen since 2011. The market in Auckland has stalled. However I feel this analysis of clearance rate is only half the story as everyone always rightly wants to know “how will this effect property prices” – far closer to most people’s real concern in many cases than the clearance rate. 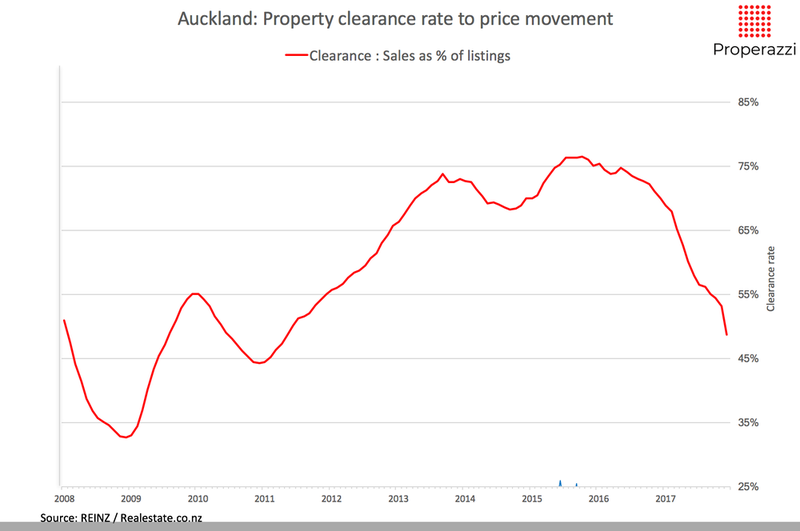 So I decided to overlay property price movements on to this clearance rate data using REINZ median prices and their annual percentage change each month. The result is the chart below for all NZ property spanning the past 11 years. The split axis allows for the ability to align the data to better see the correlation – looks like a strong correlation. However would I be going too far to say there is a causation? The logic is not new or rocket science. As the property market becomes more active with growing confidence of buyers and sellers enabled by encouraging support of banks, so the clearance rate rises, and prices start to rise reflective of demand pressure. The opposite being an easing in sales as finance dries up and confidence falls leading to falling clearance rates, flowing through into easing price pressure. Undertaking the same analysis for Auckland not surprisingly mirrors this close correlation. However what I found even more interesting is that if I adjusted the clearance rate and instead of using a 12 month moving total (which provides for the smooth even curves), I used a 3 month moving total. This representation of the Auckland market certainly supports the hypothesis of the NZ Property Report that Auckland is now a buyers market. But this is not a sudden change which just happened at the end of the year. No; Auckland has been in a buyers market for most of the past 6 months and by December it has plummeted with close to just a third of all listings selling. The key question now is what is the new year likely to bring and how will this chart of clearance rate look after the summer?